At any given time, your mouth is filled with tons of bacteria. Some bacteria are healthy, but some are harmful and responsible for causing cavities. When people say sugar rots your teeth, it’s technically not the sugar itself that causes the damage. Rather, it’s the bacteria consuming said sugar (and starches.) After consuming, the bacteria produce acid, which gathers on teeth and gums in the form of dental plaque. This plaque can be removed by brushing and flossing regularly. Without good oral care, it can easily calcify into tartar, a hardened form of plaque. Eventually, this plaque can start eating away at teeth, leaving holes and damaged tooth enamel in its wake. Your dentist calls these damaged pockets cavities or caries. Unfortunately, tooth decay can occur without any symptoms at all. Since tooth enamel contains no nerves, there’s no way to feel cavities when they first appear. By the time decay reaches the pulp in the center of the teeth, only then will you start to notice symptoms, when it’s already to late. These symptoms include tooth sensitivity and pain, especially when your teeth are exposed to sweet, hot, or cold foods. If the cavity is particularly large, you may be able to see the decay. Cavities can appear in the form of small holes and stains that are black, brown, or white on the surface of teeth. During your first visit, our dental team will start by asking you what your dental needs are. 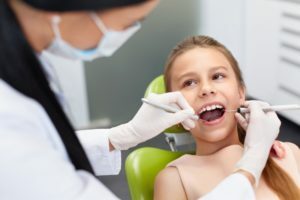 For example, if you believe you may have cavities or simply want to be examined, the quickest way to get started is to visit our website and fill out a new patient form. By printing out the form and filling it out at home, you’ll get to see your family dentist in Yakima much faster. You’ll also be able to check which insurances we accept. If you don’t have dental insurance, we also offer affordable payment plans via CareCredit. We hope you take the next steps to protect your smile from cavities by scheduling a visit with your children’s dentist in Yakima today! Dr. Lyle I. Bonny earned his Doctor of Dental Surgery degree from the University of Washington Dental School in 1987. In 1990, he purchased a small dental practice in the area. Today, he offers advanced technology to discover cavities as early as possible. To learn more about the practice or become a new patient, contact him at (509) 248-4957 or visit his website.